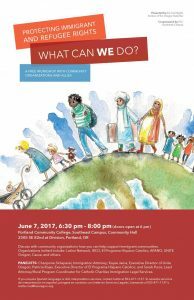 Protecting Immigrant and Refugee Rights: What Can WE Do? Discuss with community organizations how you can help support immigrant communities. Orgaizations invited include: Latino Network, IRCO, El Programa Hispano Catolico, APANO, UNITE Oregon, Casa, and others. Panelists: Chanpone Sinlapasai, Immigration Attorney; Kayse Jama, Executive Director of Unite Oregon; Patricia Rojas, Executive Director of El Programa Hispano Catolico; and Sarah Purce, lead Attorney/Rural Program Coordinator for Catholic Charities Immigration Legal Services. The Civil Rights Section maintains this website as a service to our members. Nothing on this site should be construed as legal advice, and we make no warranty or guarantee concerning the accuracy or reliability of the content at this site or the other sites to which we link.